You know those moments when you and your friends are throwing back a few beers, and one of you randomly muses that your group should create your own brew... maybe you even brainstorm names and can designs? Oh, that's strictly a Shoes N Booze Squad thing? Suuuuure. Well just in case you (or someone you know), has a change of mind, Rogue Ales & Spirits is making it easier for future fermenters to learn the art of brewing and distilling. Rogue will donate 10% of sales from the newly released Hot Tub Scholarship Lager (a classic German pale lager beer with a crisp flavor) to the Jack Joyce Scholarship Fund, which was established in honor of the company's founder to help further the education of aspiring wine and spirits makers. Since 2014, the Jack Joyce Scholarship has awarded $185, 000 to fifteen recipients at Oregon State University's Fermentation Sciences program (wait... where do we sign up?). Looking to help spur the future of one of our favorite industries? 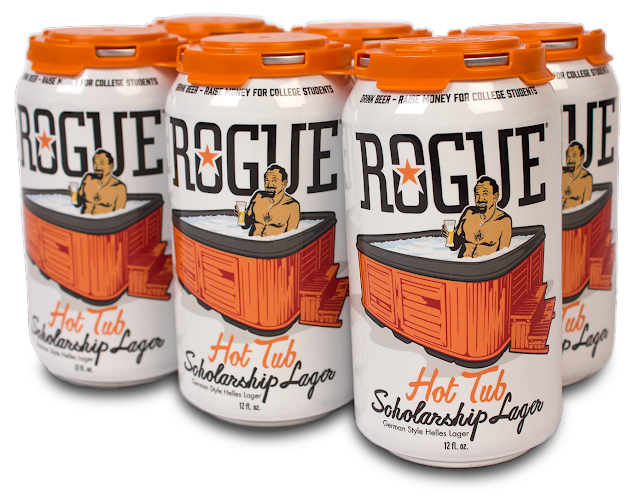 Click here for Rogue's Beer Finder to see where Hot Tub Scholarship Lager is available near you. Curious about what else Rogue has to offer? Visit Rogue.com.